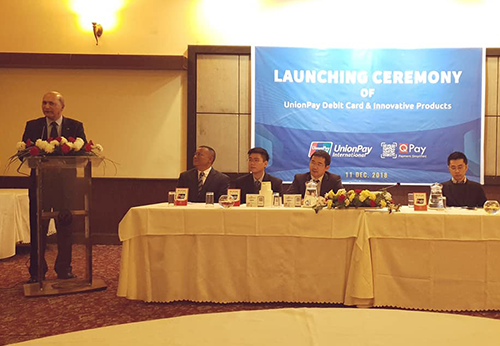 Que Pay Private Limited (QPay)is pleased to announce the launching of UnionPay Payment Products in Nepal. This is a great milestone for QPay, this association or partnership will allow interoperability between QPay and UnionPayQR Code Network, this effort is in line with Nepal Rastra Bank initiative toward digitization of the Payments services in Nepal and QPay’s current and ongoing initiatives will be able to contribute towards such initiatives. QPay a company based in Nepal has introduced a QR based mobile wallet known as QPay App. This solution inducts cutting edge technology which in turn translates into reliable, simple and easy to deploy Payment Solution thru which QPay Consumers can make payments of various Products and Services. This association will also allow QPay consumers to transact digitally for the product/ services availed at the Nabil/ Siddartha or any other UnionPay member QR merchant network similarly those banks customer and can also transact at QPayQR Merchant Network / Locations. Mobile form of payments is growing exponentially globally and this Interoperability between QPay and UnionPayQR Code Network will provide abilities for Chinese Tourist/ UnionPay Cardholders to make seamless Payments for Product and Services at QPayQR Merchant Network thru their mobile wallets. This collaboration between QPay and UnionPay will induce the growth of digital forms of payment in Nepal. UnionPay International (UPI) is a subsidiary of China UnionPay focused on the growth and support of UnionPay’s global business. In partnership with more than 2000 institutions worldwide, outside Mainland China UnionPay International has enabled card acceptance in 171 countries and regions with issuance in 50 countries and regions. UnionPay International provides high quality, cost effective and secure cross-border payment services to the world’s largest cardholder base and ensures convenient local services to a growing number of global UnionPay cardholders and merchants. © 2017 Que Pay Private Limited. All Rights Reserved.